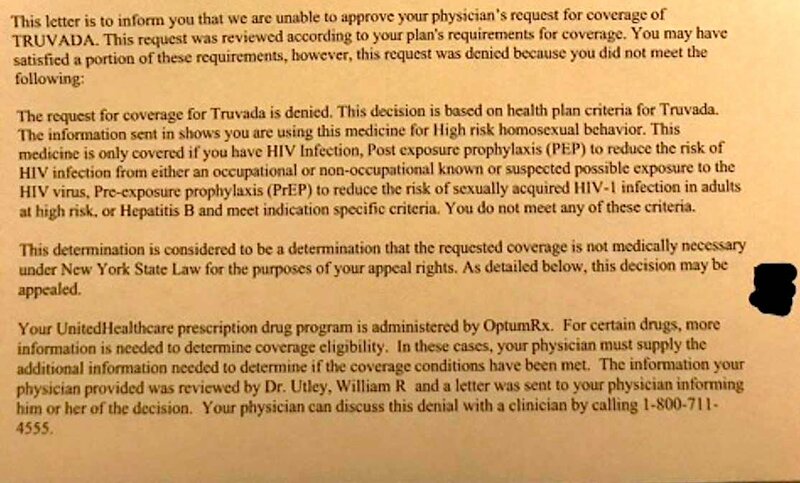 Insurance Denying Man Coverage For PrEP Due to "High Risk Homosexual Activity"
A letter from United HealthCare posted in a Facebook group for HIV awareness showed the insurer declined to pay for the man’s prescription for Truvada, which treats and reduces the risk of HIV infection and would cost up to $1,500 a month out of pocket. The insurer tells the man his plan covers Truvada only if used to treat HIV infection, reduce the risk from possible HIV exposure or potential HIV exposure for certain high-risk patients – but the man was told he didn’t fit any of those criteria. The letter claims the decision falls under New York state law governing health care coverage — but HIV activist Jeremiah Johnson said that’s not true. “This was a malicious attempt to discourage PrEP (pre-exposure prophylaxis) uptake by people who need it most,” said Johnson, of the Treatment Action Group. PrEP intervention, usually available as the oral medication Truvada, is manufactured by Gilead Sciences, Inc., which says the drug is among the most expensive they make. Johnson said the man’s doctor appealed the coverage denial, and United HealthCare ultimately paid for the drugs — but he said the episode highlighted significant barriers to treatment. Truvada must be ordered online and delivered by mail, which Johnson said was problematic for anyone trying to safeguard their privacy, and requires an intricate report filed four times a year by their physicians. “This is an enormous barrier for some people,” he said. United HealthCare has not yet responded to requests for comment. Raw Story CEO John Byrne is the co-founder of Prevention Access Campaign, a nonprofit focused on improving education and access to biomedical HIV prevention, including PrEP, and United HealthCare covers Raw Story employees. The PrEP intervention is used by up to 100,000 patients in the U.S., and can reduce the risk of HIV infection by 99 percent. An HIV activist group sent a letter to the New York health commissioner about the matter, and included a petition to sign on.